OTTAWA – February 15th, 2011 – National resale housing activity climbed further in January 2011, according to statistics released today by The Canadian Real Estate Association (CREA). Seasonally adjusted national home sales activity rose 4.5 per cent in January 2011 compared to the previous month, reaching the highest level since April 2010. Led by Vancouver and Toronto, seasonally adjusted sales activity posted monthly gains in more than half of all local Canadian markets in January. National sales activity has improved steadily since last summer, and now stands almost 25 per cent above the low point reached in July 2010. We anticipated the recent announcement of tighter mortgage regulations, which will come into effect this March, would pull forward sales activity into the first quarter of 2011, particularly in some of Canada’s more expensive housing markets,” said Gregory Klump, CREA’s Chief Economist. “The sharp rise in sales activity in Toronto following the announcement provides early evidence confirming this,” said Klump. 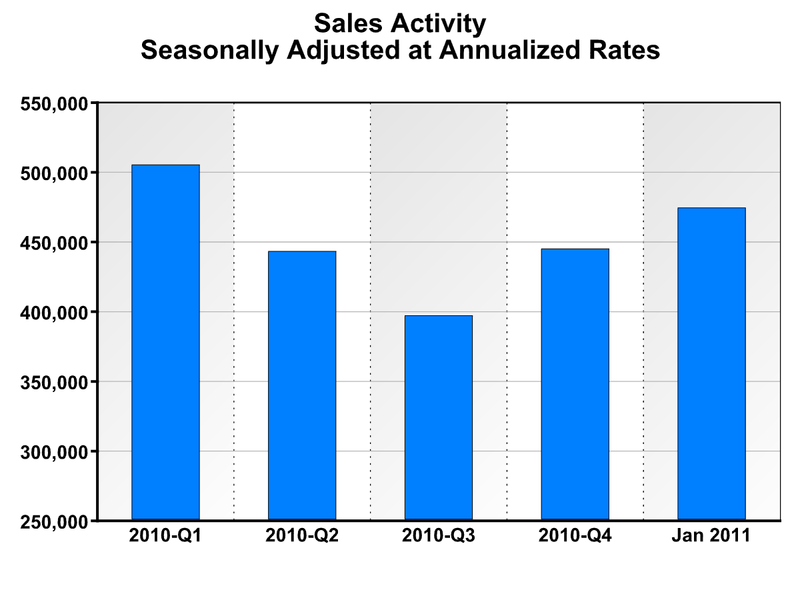 Actual (not seasonally adjusted) national sales activity via the Multiple Listing Service® (MLS®) Systems of Canadian real estate Boards came in 6.6 per cent below levels in January 2010. This was the smallest year-over-year decline since May 2010. Actual (not seasonally adjusted) new listings on Canadian MLS® Systems normally post their biggest month-over-month increase in January. January 2011 was no exception, marking the first time since 2007 that new listings more than doubled in January compared to the previous month. As a result, seasonally adjusted new listings rose 3.9 per cent from December levels, the largest monthly gain since March 2010. Sales activity has been on the rise and prices have been stable since last autumn, so CREA had been expecting potential sellers who shied away from the market last summer to begin listing their properties in early 2011. Because sales activity and new supply rose in tandem in January, the national resale housing market remained balanced. The national sales-to-new listings ratio, a measure of market balance, stood at 55.7 per cent in January 2011, which is little changed from the previous two months. Just over half of local markets in Canada were in balanced market territory in January. The number of months of inventory represents the number of months it would take to sell current inventories at the current rate of sales activity, and is another measure of the balance between housing supply and demand. 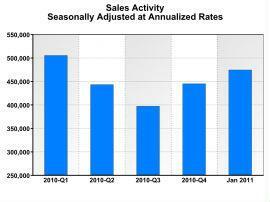 The seasonally adjusted number of months of inventory stood at 5.5 months at the end of January on a national basis. This is the lowest level since last March. About two-thirds of local markets recorded year-over-year gains in average price in January 2011. The national average price for homes sold in January 2011 was $343,675. While this is little changed compared to the previous three months, it represents an increase of 4.5 per cent compared to January 2010. Much of the year-over-year gain in January 2011 resulted from a jump in the number of multi-million dollar home sales in a couple of areas in Greater Vancouver, the effects of which were amplified at the local, provincial, and national levels by the fact that actual monthly volumes for sales activity are low in January compared to other months.